Last week we went to Arizona. First, we went to Sedona, about two hours north of Phoenix, in the middle of some of the most scenic country in the United States. It’s red rock country — beautiful mountainous terrain. It’s cowboy country too, or at least movie cowboy country. 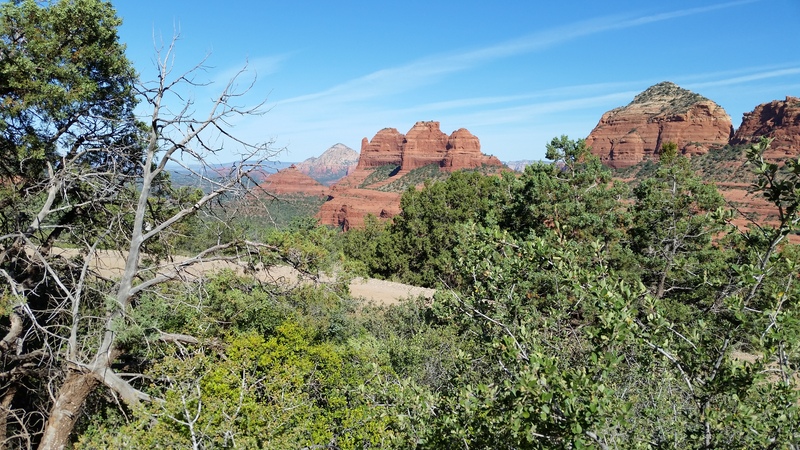 Dozens of western movies have been filmed in the red-rock canyons that surround Sedona, and every wannabe cowboy from John Wayne to Elvis (yes, the King filmed westerns) has shot footage here. It’s New Age country. Maybe it’s the fabled vortexes that exert some type of convergent energy field in select locations near the town, or maybe it’s the reports of UFOs over (or under) nearby Bell Rock, but you will find, in Uptown Sedona, a most eclectic collection of citizenry. Psychics are on every corner. You will find people who can read your aura – you can energize your chakras. You can convene to a drum circle. You can get clean and sober here – for a price – big price. But most of all, Sedona is a friendly town. A very nice Sedona gift shop lady tells us that in her spare time, she paints pictures of fairies. I ask her if she’s ever exhibited her paintings in her shop, but she tells me that she once tried, but that the fairies did not like it in the shop – so now she sells them elsewhere. She did not say where. She shows me how to press my hand into a Brazilian geode and she tells me to close my eyes and to describe how I feel. Presently, I tell her that I feel a tingling in my palm…I don’t tell her, but I feel that a lot, geode or no, but she says I’ve felt something unique. I am not so sure, but maybe I did. My wife tries the same exercise and doesn’t feel anything. She’s disappointed. She buys a postcard and an ankle bracelet. The lady explains that people come to Sedona for a reason. She says we are probably seeking something. I leave with an open mind. After lunch, we find the trail to Devil’s Bridge just outside of town, and we hike the two mile trail up to the bridge. Something about clambering over 100 million year old rocks does it to me. I feel it. That energy that they are talking about. I feel it in my bones. I feel the ancient earth. Forget the UFOs and the fairies. Something has been going on here for a long time but I can’t explain it. Maybe it’s the Mother Earth thing, but I know that I am in awe of something bigger than myself. Forty miles north in Flagstaff, we stop for lunch at a brew pub on San Francisco Street. After we eat, we go into a crystal shop across the street from the train station. My wife picks out a half a dozen crystals. Two girls working the register are discussing energy fields when we walk in. My wife isn’t a believer but she’s hedging her bets. She’s buying crystals. They mean different things, the crystals. Some are good for one thing or another – prosperity – serenity – strength. Not sure if I’m buying into it. My wife picks through the crystals, while I retreat to the book rack in the back of the store. There I find a deck of tarot cards and I consider buying them as a novelty, but I put them back. There is no need to mess with tarot cards right now. We pay for the crystals and leave town. We take I-40 east out of Flagstaff. We drive 90 miles across the Colorado Plateau to Holbrook in the heart of Painted Desert country. We arrive in Holbrook at about four o clock in the afternoon. I like the town. No movie company cowboys in Holbrook. Real cowboys live here. Ranchers live here. They drive Silverado trucks and F-250s – everybody pulls a livestock trailer. They fuel up at the Maverik station on Navajo Boulevard on the north side of I-40. Ranchers wear dusty Stetsons and beat up boots. No star gazing astrologers or hundred dollar ‘per-reading’ psychics in Holbrook either. There are petrified wood shops, Native American crafts and Route 66 memorabilia here. We stop at a Mexican restaurant on Hopi Drive. We order tacos and beers from a girl who my wife says looks too young to be working. I tell her that the girl is probably older than she looks. A few minutes later she returns with our tacos. Behind her, the manager follows with our beers. She’s too young to serve alcohol the manager explains. The next day we drive through the Petrified Forest National Park. It’s unlike other parks we’ve visited, like Yellowstone, or Yosemite, or Rocky Mountain National Park. It’s empty – like the moon – in the Petrified Forest. Even the ranger in the welcome station looks petrified. Things change very slowly here, but it is a reminder that things do change. They sure as hell don’t change on our time though. Whoever is running this place has his/her own calendar. A million years is nothing. Next day it’s time to say goodbye to Holbrook and the ranchers and the desert and the petrified wood. On our way out of town we cross the Santa Fe tracks one last time. Just beyond the tracks, on the main highway out of town, a four foot rattlesnake lies dead in the road. Crushed perhaps under the weight of Silverado and F-250 trucks pulling livestock trailers. Glad I didn’t see that guy when we were climbing rocks I say to my wife…she doesn’t reply. We head southwest, toward Payson, Arizona, then on into Phoenix. We drive across the plateau, then back down into the desert. Big cactus in that desert. My wife wants a picture, but the road doesn’t offer a pull-off. Not like Colorado my wife notes. They know how to deal with scenery in Colorado. She wants a picture of a saguaro cactus but there is no place to pull over. Here in Arizona she can’t catch a photo-break. By the time we reach our hotel in Phoenix it’s raining. Damned rain I say. I didn’t think it ever rained in Phoenix but it does. After a while it lets up and we go out to eat. The next day we fly out at 6am. On the flight back to Florida, my wife sits in the aisle seat. I’m in the middle and beside me is a young man of 16 or 17 years of age. He calls me sir and my wife ma’am. He tells me he’s been through a lot. When I press him for details he tells me he’s on his way home to Miami after spending the past six months in military school. Apparently not his decision – military school that is. I did not ask what incident caused him to be sent to such an institution, but he tells me he hopes not to be sent back in the fall. Once we reach cruising altitude, I pull out my Kindle. I’m reading “Cities of the Plain”, by Cormac McCarthy. The young man asks me about my Kindle and I tell him that I have had it for several years. He says that it looks really old. Not as old as a petrified log I think to myself. My wife falls asleep. Her crystals are carefully packed in her carry-on bag. Texas passes under the plane and I wonder if there is something to it all. The crystals, I mean.